This was lovely right off the bat. The label wasn’t great, but the wine had beautiful colour, smelled of nothing really, and was very smooth to drink. 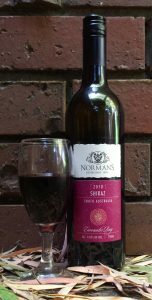 It didn’t have the complexity that you expect of a Shiraz (with that lovely after-glow effect in the back of your throat) but maybe that’s because we opened it a few years after its prime. This went down very easily, and while we teamed it up with a belated Australia Day BBQ, it could easily have been at home with soft cheese in front of a fire in the middle of winter with that someone special. Yes, I’m talking about the cat, because I wouldn’t have to share it with her. Well, maybe I’d have to share some of the cheese, but not the wine.